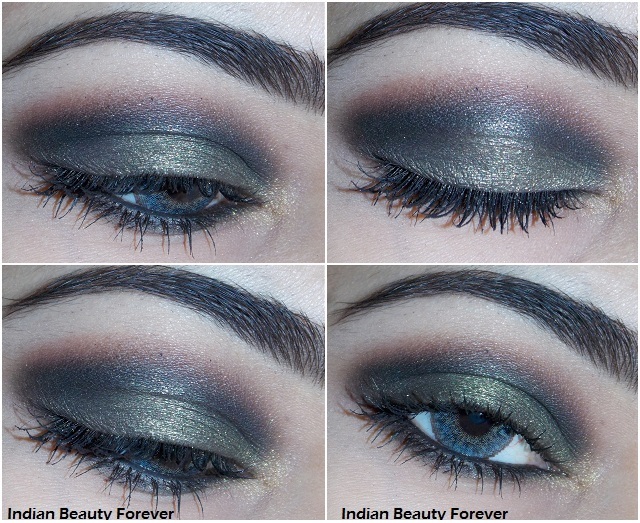 I will share this eye makeup today which is dark, glamorous and more a night time makeup for winters. By the way, now it feels that winters. the famous Dilli ki sardi is finally here. Today is weekend and you all might be relaxing, hanging out or may be out for some retail therapy. Nothing works for a woman like the way retail therapy does!!! Yesterday, I posted an eyebrow tutorial where I tried to show you how I do my brows with brow powder, hopefully, you find it useful. See here, if you haven't. Moving on, I did this look last week where the colors I choose are very deep and dark or I should better say, colours of winters. 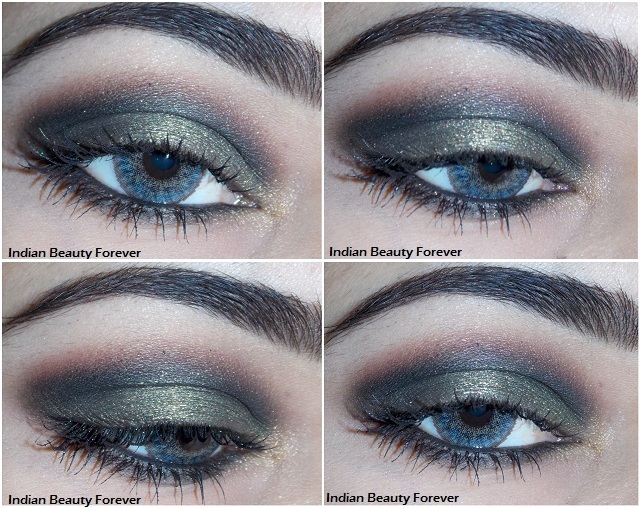 I used Olive greyish green, black and some cranberry to balance out the whole look from getting too much on the dark side. 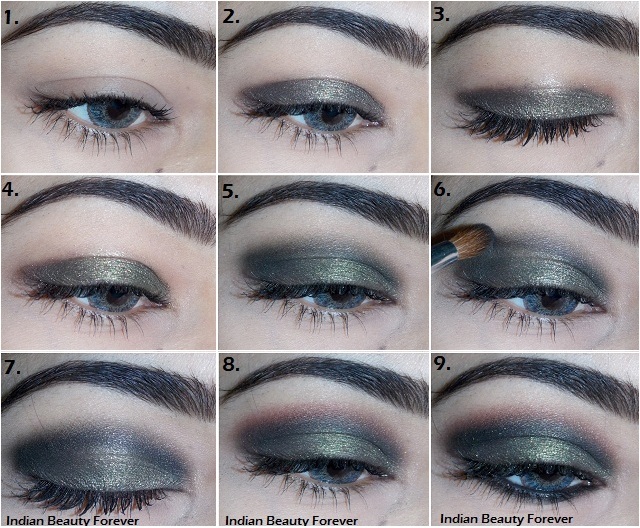 Here’s the step by step tutorial for this Smokey winter Eye makeup look. 1. I primed my eyes with BB cream here instead of my all time favorite Faces Canada eye primer. You can use ponds BB cream or any BB cream as eye primers if you wish, they do a decent job. By the way, I already have my lashes coated with mascara here since I had shot a tutorial for mascara just before this tutorial. 2. & 3. I used an olive grayish green color which has a pearly finish. If you wish to use a matte shade go can go ahead though here I used pearly shade as other shades that I had used are matte and also I wanted some shimmer on my lids. Shimmer is good for night time and winters. 4. I gently blended the edges. 5. I used a matte black over and above the crease. 6 Using a tapered blending brush, I blended it over the crease. 7. I used a gold eyeshadow on the inner corner of my eyes. you may use silver if you like. 8. Now, over the matte black shadow, I have used a cranberry eyeshadow over the black to give some warmth and balance out the grey, black and olive green that I had used. 9. I applied kohl on the waterline and some just below the waterline and smudged it with a smudge brush and I am done!! I applied only one more coat of mascara as I had loads from the start anyways! If you wish to see some basic eye makeup brushes, see HERE. Enjoy the weekened and with Christmas round the corner, I will share one more eyelook, a christmas special.